At a time when bullying and depression is on the increase amongst children and adolescents, an educational app to help build self esteem and optimism has been created by a Melbourne schoolgirl and her family. Positive Penguins is one of a kind. The app is a simple, interactive, educational tool to help children understand their emotions and to experience them in a positive way. It also provides children with practical ways to understand and cope with these emotions and, most importantly, change the way they think. The app is a simple, interactive, educational tool to help children understand their emotions and to experience them in a positive way. In the home page of the app, the “Settings” option in the top corner has 3 options: Sound off/on, the option to enter an email address to receive notifications about the app and the option for the app to ask every few hours how the child is feeling. If you choose to leave the sound ‘on’ then most of the worded content in the app is read out loud via a pre-recorded voice. The learner has 4 main icons to choose from. The only thing we would suggest here is to have some direction provided to the learner on the home screen to help with the usability of the app. We had to play around a little bit before we actually understood what to do. 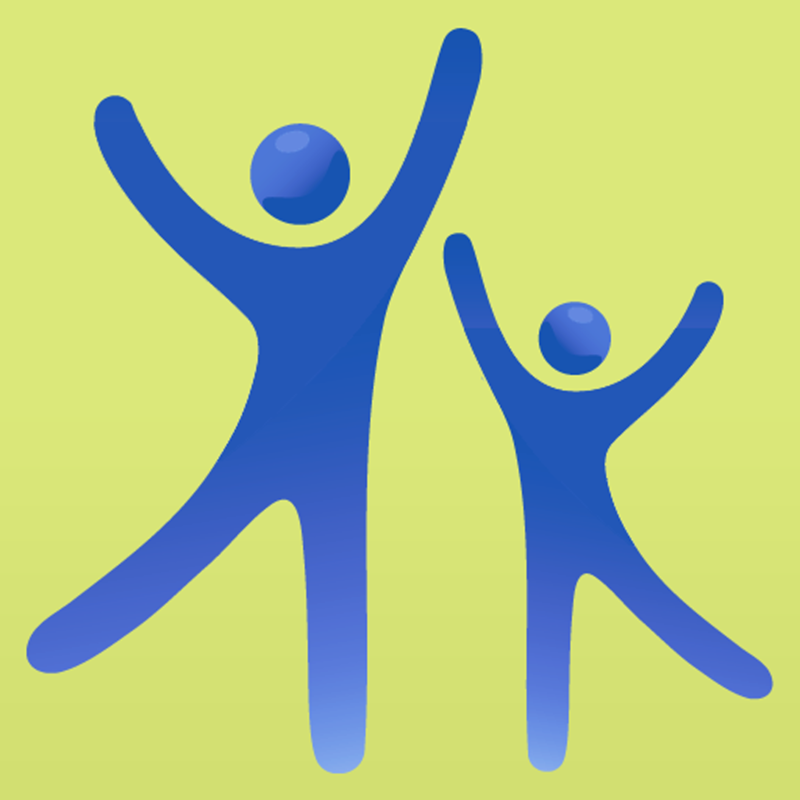 1) The ‘Examples’ icon lists two examples of where one child is feeling sad and the other frustrated. Within each example a list of questions and answers are provided to show the user how the app can be used to challenge negative thinking. 2) Upon entry of the “How are you feeling?” icon, the learner is presented with 12 different moods. 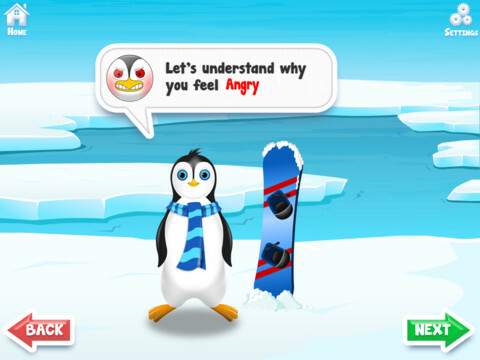 Each one has a cartoon image of a penguin showing an expression representative of that mood and the text colour of each mood is different to add variation. In the top corners of the screen there are the ‘Settings’ and ‘Home’ icons available. After clicking on the mood that applies to you, the learner is shown a mood meter with a slider that they can moved to indicate the severity of the emotion being felt, for example very angry or slightly angry. The next few screens allow the user to pick the gender of the penguin and to personalize the appearance of it. This makes the learner feel comfortable and therefore more likely to divulge how they truly feel because this penguin represents their personal friend. The next few steps of the exercise are designed to understand how the learner feels and why. So after the learner types in the reason for being in such a mood using the device’s keyboard, this answer is then incorporated into a preset question that asks why that given reason is making the learner feel the emotion they are feeling. Before typing an answer, the learner can also view a list of suggested answers for guidance. 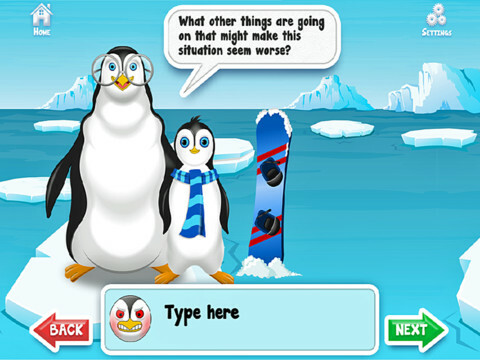 The question appears in a speech bubble and is illustrated as though the chosen penguin is asking the question. This again plays on the idea that the penguin is the learner’s friend, and so builds confidence and trust. The next screen confirms your answer and you can choose to change this or confirm. Then you are introduced in turn to 4 penguins. Each one asks the learner questions around the topic of why they feel the way they do and, ultimately, the learner is asked what they would advise a friend experiencing the same emotions and thoughts. Upon completion, the learner is congratulated by the initial penguin they chose and encouraged to use the advice they would give to others to help change their own thought processes. Once completed, the whole process can be emailed to the user to act as a reminder of the advice that he/she has given him/herself. 3) The ‘Info for Teachers and parents’ icon when pressed on opens up a summary page of what the purpose of the positive penguins app is. There is even an option here to visit the webpage of the app for lesson plans, worksheets and other resources. This gives parents and teachers the tools to make the best use of the app when working with young children and encourages further learning into the subject. 4) The ‘Game mode’ icon opens an interactive game. Upon entry you will presented with a ‘Play Now button’ and in the top corners of the screen you can access both the settings option and press the Home button to return to home page. When you start playing, the game consists of various levels. In each level the learner is a penguin throwing snow balls at a group of fish. In the top left corner of the screen one can click quit at any time and return to home menu. The idea is to judge the distance that each snow ball is thrown so to sink all the fish floating on the ocean within a time limit and using a preset number of balls only; the remaining number of balls and seconds is clearly indicated in the top right hand corner of screen. Upon competition, you are awarded points and ranked within a score board for future reference. Your position in this board depends on how many snow balls were used and how long it took to finish the level. The difficulty of each level is increased as the learner progresses through the game. This adds replay value and motivates the user as it challenges them to do better. One of the parents who used the app mentioned that he was not sure whether the game actually provided value to the app. If the app about understands and dealing with emotions, is it not counter-productive to provide a game that takes you away from your emotions? Overall, the app is very good. We have never seen an app that summarises the use of Cognitive Behavioural Psychology quite so effectively. We would just like to say that it is also important to teach children that having negative emotions is ok and that there is no need to deny them. The important thing is to work through them in order to manage them a little bit better. The app is a tool to achieve that but not the cure. Despite this caveat, the app is a fantastic resource for children and adults to engage and work through feelings to aid positive emotional development. Overall a 5 Star App. If you want your child to be successful, teach them how to challenge their thinking. 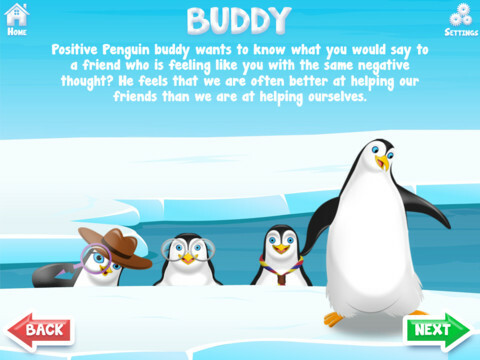 Positive Penguins is a fun educational app to help children learn to be more resilient and help them respond to the typical challenges they face everyday. It also helps parents work through these challenging situations with their child in a fun and non-confrontational way leading to a more positive outcome for both the parent and child. One of the most important tools to teach children is that they have a choice in how they feel about situations and that no one can make them feel a certain way. We feel the way we do based on our ‘self-talk’ (or thoughts) and if children can learn to listen to their self talk and challenge negative thinking on a regular basis, they will be more resilient and have more opportunities to flourish and develop into more successful and happy adults. Positive Penguins is most effective when parents or teachers guide the child through the fun journey. Older children (8+ years) can also use the app alone easily.